Deputy President William Ruto rushed to Agakhan after he collapsed at his Karen residence. - Bana Kenya News, Real African Network Tubanane. Home Editorial Deputy President William Ruto rushed to Agakhan after he collapsed at his Karen residence. Deputy President William Ruto rushed to Agakhan after he collapsed at his Karen residence. The Deputy president William Ruto was rushed to a hospital this morning following abruptly heart attack and collapsed in his home in Karen. The deputy president was rushed to a Nairobi hospital unknowingly. The people have been told to be calm as the Government is looking forward for his recovering. It is speculated that the deputy president will be sent to S. Africa for proper treatment if his condition will not be taken off. According to an eye witness so many cars passed with an ambulance from the Vice president residence and ended up in Agakhan hospital, another one added. It is the second time the Deputy president have had the same function since he got to power. 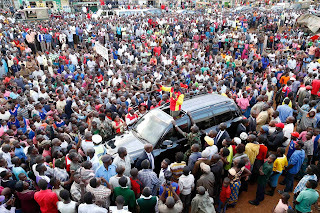 Kenyans have been longing for better health for the deputy president. He was expected to hold a rally in Western today because a series of rallies since yesterday were to end tomorrow. He was to launch rural electrification project at Kakamega. Due to the emergency condition, the project will proceed as stated but the launching will be done later on. The Government is expected to give out his state with deputy president condition. The people who are expecting to visit him in the Hospital includes the President Uhuru Kenyatta and some opposition leaders.